Certain works of fantasy are immediately recognizable as monuments, towering above the rest of the category. Those of such authors as Stephen R. Donaldson, Robert Jordan, and Terry Goodkind come immediately to mind. 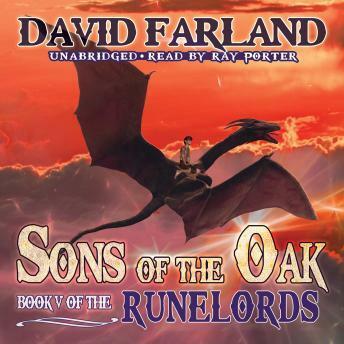 Add to that list David Farland, whose epic fantasy series continues in this fifth installment. The story picks up eight years after the events of Lair of Bones and begins a new chapter in the Runelords saga focusing on Gaborn's son, Fallion. Gaborn, the Earth King, has been traveling far from his home, to strange and unknown places. While beyond the edge of the earth, he finally succumbs to accelerated aging, the price of all the endowments he has taken. His death is the signal for a revolution, an attack from the supernatural realms by immensely powerful immortal beings. These forces have discovered that Gaborn's son is the resurrection of an immortal—one whose potential power is so great that he might be able to reorder the entire universe. Fallion's enemies have decided that they must control him or, failing that, destroy him. He is only a child, but he is the heir to Gaborn's kingdom and so must flee to the ends of the earth to avoid the destruction of all that Gaborn accomplished. One of the mightiest of contemporary fantasy epics continues.